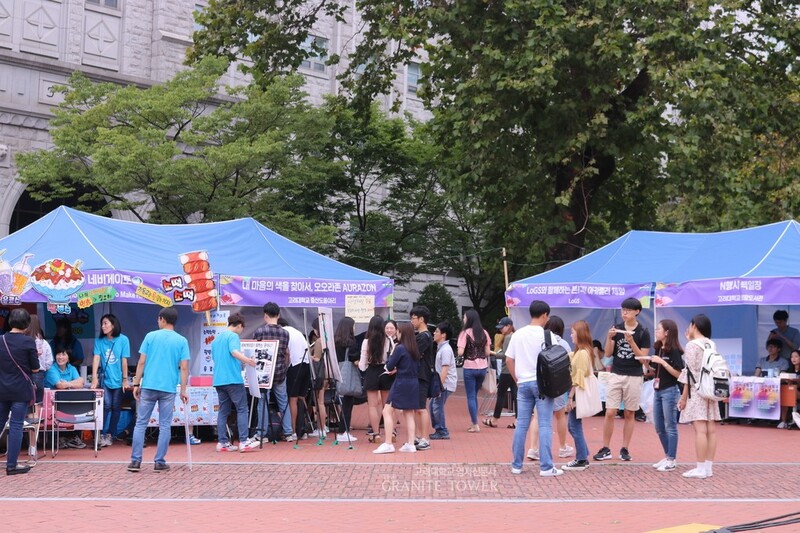 From September 11 to 13, the 2018 Autumn Festival of Korea University (KU) Anamzon is being held at the People’s Square, providing clubs in KU an opportunity to promote and introduce themselves. Conducted by the 35th KU Club Union Mojaram and planned by Anam Youth Association (AYA), about 40 organizations including clubs belonging to Mojaram and small groups of departments joined this festival. In Anamzon, each club could express its uniqueness from the booth, by displaying first semester’s works or conducting activities that represent itself such as quizzes, games, and art crafts. Notably, clubs with similar characteristics could gather up and conduct a big project as a branch unit, just as National Anamgrapic’s exhibition which is going to be held on September 12 by the clubs from the Branch of Exhibition and Creative Arts. AYA stated, “What is a festival? What can we do in a festival in which only celebrities are being invited on a stage and only fancy, manufactured goods are being exhibited?” According to the association, the festival’s name Anamzon was named after the similarity of the Amazon forest that, Anam is like one biosphere where one interacts with each other while maintaining oneself. It is expected that Anamzon will be successful, being a big biosphere at Anam, painting KU with their individuality.